Alpha Stamps is carrying a product called "Flower Soft" which is available in different colours (cross my fingers more will be listed shortly). 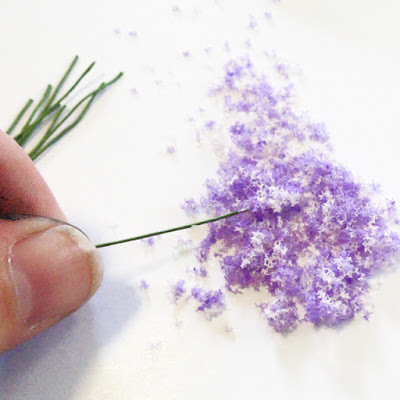 I was asked to do a tutorial for creating the flowers with this fluffy stuff and I feel sort of guilty about it because it is INCREDIBLY easy to use. Gather some florist wire and a pour out a small pile of Flower Soft. A little goes a looonng way. 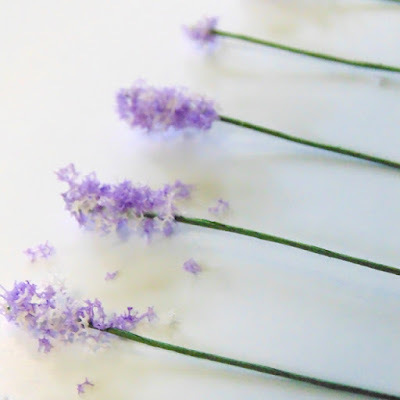 Side note: Whenever I use little wired flowers, I trim them and am left with a short length of wire. 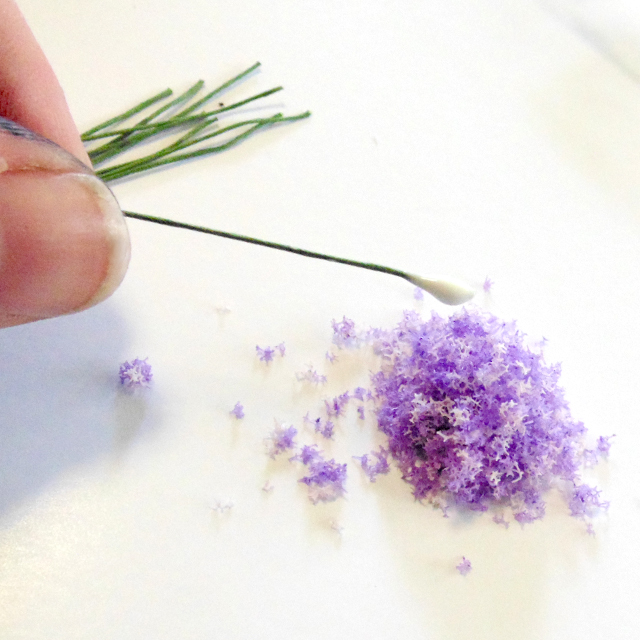 These trimmings are perfect for creating these flowers because you really only need 1.5" or so of wire. So save those scraps! Put a healthy glob of glue on the end of the wire. My glue of choice is Aleene's Tacky Glue because it is super thick and usually stays where it's told. Roll the gluey end of the wire in the product. Set aside and allow to dry. That's it! 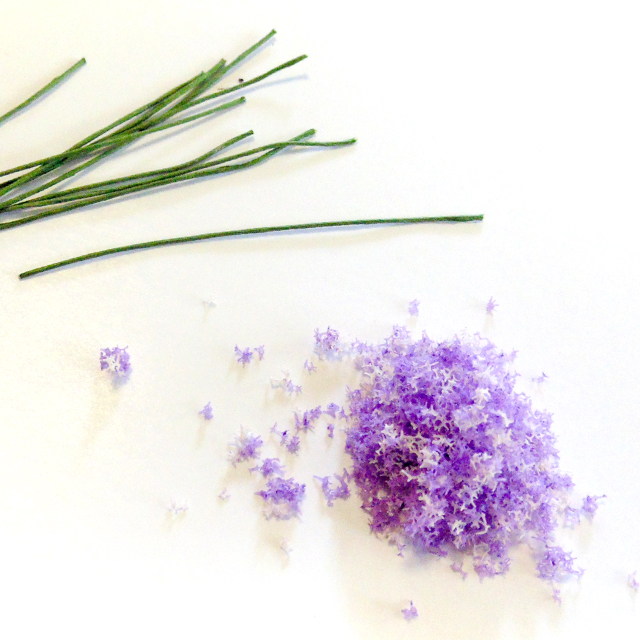 You'll have sweet little floral stems ready for microgardening or bunch them together to make the wee-est bouquets. 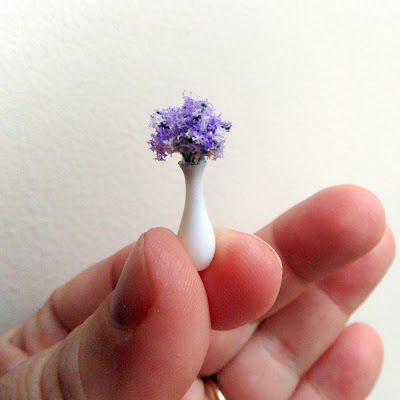 Just look at those tiny flowers in that sweet wee vase from this Miniature Vase Set (I'm holding the smallest one below). Aaannnnd, for my bit of Alpha Stamps news: they'll now be selling my Corner Box and Frame Front Box. I'm really excited about this because Canadian shipping prices are outrageous (*shakes fist at Canada Post*) so you actually save a few pennies. Finally, you'll also be able to purchase my Miniature Fairy Godmother Magazines Collage Sheet and Miniature Tooth Fairy Letter Collage Sheet from Alpha Stamps also. That's it for today, but be sure to come back for another visit because I've got loads of good stuff coming up over the next couple of weeks. Smooches lovelies! 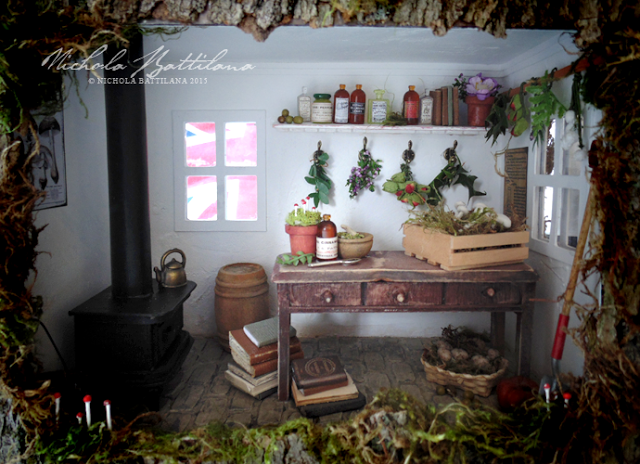 I purchased several packages of the flower soft from AlphaStamps so now I know what to do with it, lol. 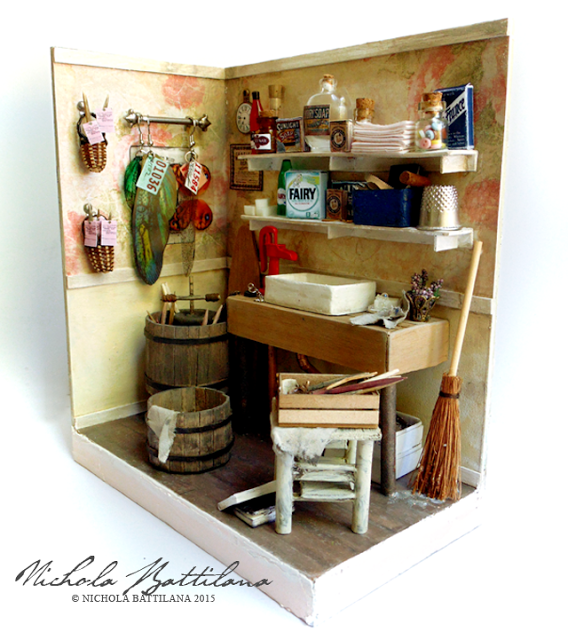 Great news about AS carrying your Corner Box & Framed Box. I'll be looking for your collage sheets, too:) Congratulations! Flower Soft is great to add on a card for extra detail especially on bushes, trees, flowers, etc. For example: stamp a daisy to make a card front, color it in with marker of choice and then add the glue and yellow Flower Soft to the center. Gorgeous. Same with sunflowers. There's even a few mixed colors that make spectacular trees, especially the spring and the fall color blends. Thanks for this new way to use it Nichola - I never thought of that. Eoh my.. Your project is awesome. Such a lot of fabulous details. I could study this again and again and keeping on finding new details.